-- On the wrong side of South Africa's racial divide. "Midway through the Dave Matthews Band's sellout show at Giants Stadium [New Jersey]," writes Leita Tayler of Newsday, "the group brought a South African pennywhistle player onstage and seamlessly backed him as he trilled some buoyant township jive. "Band members had rehearsed with pennywhistle player Big Voice Jack only the night before, yet they sounded as though they'd been jamming with him for years. And listeners, many of them teenagers and twentysomethings who likely had never heard such music before, embraced it enthusiastically." Tayler's review certainly matches the gobsmacked first-hand accounts of the night, but there's one thing she got wrong. Big Voice Jack Lerole is no ordinary pennywhistle player. The man's a master. And, as an artist, he goes back a long way. It all began for Jack in the Fifties. Apartheid was taking mean shape and some white kids were already bored to tears with vastrap, tikkie-draai and the isolation of their controlled leafy-avenue existences. They wanted some soul - some rhythm. They headed for the streets where they found their black counterparts (though usually much younger). By that stage the pennywhistle had taken charge of township and city streets in a big way. Though the city was a no-go area for many black people, the whistlers found ways to circumvent the ridiculous laws of the time. The creators of what became known as kwela music were far too enterprising for the police, and it was a great time for South African music. The emergence of Willard Cele as the first big pennywhistler was the turning point in many young aspirant musicians' lives. Cele's appearance in Donald Swanson's film Magic Garden inspired many, even in remote rural areas, where Spokes Mashiyane was born. Having seen the movie, he set his heart on acquiring a whistle and soon after his arrival in Jo'burg created a frenzy with his very first single, Ace Special. It set the pace for others who'd been operating on the streets for years. Moreover, he revealed the hidden powers of the instrument. His technique took the music to a different level. Alexandra township was a reservoir of music, especially pennywhistle jive. The biggest, most popular act from Alexandra was The Alex Shamba Boys, led by brothers Jack and Elias Lerole. This band, like many others, operated on the dusty streets of their neighbourhood. It was a tough 'hood - it still is. Then, marauding gangs terrorised everyone and harassed musicians in an attempt to control them. The band used to go around carrying tomahawks, the small axe made famous by American Indians. By then the brothers had met David Ramosa. Later, Zeph Nkabinde, singer Mahlatini's older brother, joined. They jammed together on Ninth Avenue and ventured into the mean streets of Johannesburg daily. It was difficult to make a hit with Mashiyane around. He was the kingpin and everyone else had to be satisfied with the crumbs. But Mambazo weren't going to fold their hands and let Spokes ride all over them. Their major break came when they added guitar and vocal harmonies to their music. Up until then, kwela was just the one guitar accompanied by pennywhistles - one taking the lead. Jack was the one who sang, becoming the first kwela "groaner". Unlike Mahlatini, Lerole was never a natural baritone, and his vocal chords took a beating - it wasn't just tobacco and alcohol that put the gravel in Big Jack's voice! Audiences took to this new style of singing. It was the forerunner of mbaqanga, the sound which Mahlatini and The Mahotella Queens later took to the world. With their new sound, EMI couldn't resist signing them up in 1956. Not uncommonly for the Fifties, the band recorded under many names, such as the Alexandra Shamba Boys - but the one that stuck was Black Mambazo. The name is based on the Zulu word for axe. The popularity of Tom Hark did little for Mambazo, as their countrymen didn't get to hear it. But it did introduce this incredible sound to an international audience. Their record deal took the band off the street and into dance halls around the city, from the dusty streets of Alex to Orange Grove, Berea, Yeoville and the city proper. They'd been to all these places before - the difference being that this time they were invited inside. Meanwhile competition remained fierce in Alex. But it was Jack who came closest to a hit to compare with Mashiyane's when he recorded Blues Ngaphansi, which made him a national star. But the time came when kwela looked like it was nearing an end. Black Mambazo soldiered on. All the pennywhistlers knew that as long as Mashiyane was still playing, everything was okay. But one day Mashiyane disappeared from the scene. A plot was being cooked at Gallo. They bought him a saxophone. The logic? He was the king and wherever he went the rest followed. When Mashiyane came back from hibernation, he was blowing an alto sax. The tune, Big Joe Special, featuring Dan Hill, became an instant hit. 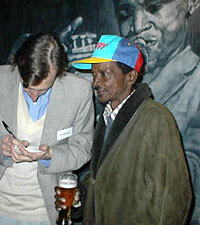 It spelt the death of kwela - the music of the street that captured the imagination of a generation. Ironically, its chief exponent was the one who delivered the final blow. It meant the end of the road for Black Mambazo and the rest of the pennywhistlers. They all had to learn to play the sax - and fast. "I learned the saxophone so I could make a living," says Jack. The sax jive - later dubbed mbaqanga by jazzman Mike Xaba - was the new craze and Mashiyane was at the forefront. The groaners also took to it and proceeded to become the new kingpins. Although Jack had been the first to show the commercial possibilities of groaning, he was overtaken by younger singers, like Mahlatini who is still regarded as the king of mbaqanga. Session work beckoned for many of the older artists - backing for the new stars of mbaqanga, like The Mahotella Queens and The Dark City Sisters. Jack Lerole never stopped playing, though he went through hard times. He recorded a couple of albums in the Sixties with Teal record company and had hits with numbers such as Cherry Beat, Big Voice Jack, Tully la Fluter and Bongo Twing Jive. In the Seventies he cashed in on the bump jive craze in the townships. His albums did fairly well, but his popularity never reached the same heights. Between sessions he toured extensively with South Africa's stream of stage musicals. It took an Afrikaner in the form of maverick film-maker Chris du Plessis to bring Big Voice Jack back from obscurity. It all took root in the Fifties when Du Plessis, the son of a diplomat, was living in New York City. He used to hear the music late at night when his folks were entertaining. Whenever the booze began to flow, his dad would haul out his collection of kwela records and some Miriam Makeba numbers. When nostalgia struck, they danced to black music. Coming back home as a teenager, Du Plessis continued his love affair with kwela. He visited the famed Marabastad record shop every week to buy 78s. Many years later, he went out to seek the grand old men of pennywhistle: Albert Ralulimi, Peter Mokonotela, Kid Moncho, Ntemi Piliso and Alex Black Mambazo. Mambazo reformed after 35 years for the documentary and decided to stay together as a group after being offered gigs at the increasingly renowned Bassline by proprietor and jazz firebrand Brad Holmes. Holmes's faith in the band has been repaid. The band has taken him to America as their road manager - "Because I trust him - he's a kind boy," says Jack. And that, coming from a Fifties musician, is quite an earth-shaking statement. Virtually everyone from that era claims exploitation at one time or another. When South African-born musician, Dave Matthews - who has hit serious chart status in the United States - visited Johannesburg recently, he caught the band in action at the Bassline and was bowled over. He later invited them to jam with his band on their current American tour. Collaborations between the two bands during the tour went down like iced tea in a New York summer. Tickets for the Giant Stadium gig were sold out within an hour of going on sale. The American reviewers went wild for Jack and Mambazo. And, as far as the Dave Matthews Band were concerned, Jack might just as well have been Elvis. According to Holmes, the dudes were in serious awe of the legend. But more in a whisky-soaked cameraderie way than a look-up-but-don't-touch-the-saint kind of a way. With Jack's wild stories, his crazy sense of humour and his unquenchable passion for jazz you'd have be strange not to like him. For the Shukuma Mambazo All Stars, as the band is now known, the road travelled has been long and hard but the future looks promising. The legacy of kwela can never be complete without the story of Black Mambazo. A documentary on the history and happenings of the tour is being made by South African filmmaker Jonathan Dorfman and will hopefully be screened locally later this year.